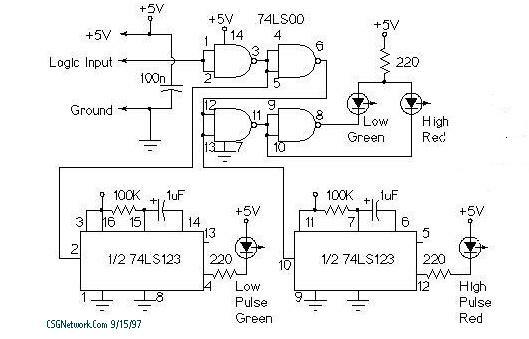 This circuit is supplied as a hobby project. It uses indicator LEDs to display various logic states for high, low, rising pulse, and falling pulses. It can be used as a general troubleshooting tool and is particularly useful for debugging TTL and CMOS logic circuitry. In this design, the first 74LS00 gate acts as a buffer for the input logic pin. The following gates invert the signal, then further buffer it for driving the designated high and designated low LEDs. The first 74LS123 one shot stretches out low going pulses so that they blink the designated low pulse LED for a long enough time to be visible to the user. The second 74LS123 does the same thing for high going pulses. This is a relatively small project and the circuit can be built on pre-perffed circuit board and wired by hand, wrapping or soldering, or both. The completed circuit can be assembled into a small transparent plastic box with the probe wires exiting one end, or a project box with a window or external mounted LEDs. The LEDs should be visible from the exterior of the box. IC sockets may be used for easy chip replacement and testing. This is designed to be powered from the circuit under test but can be powered externally or internally battery powered if totally power independent operation is desired. To use this construction project result, clip the probe's ground and +5V lead to the corresponding ground and +5V rails on the logic circuit under test. Connect the probe lead to the logic lines for evaluation. The indicated high and indicated low LED present visible evidence of high and low logic levels. A single high pulse will cause the indicated high pulse LED to turn on, and a single low pulse will cause the indicated low pulse LED to turn on. A square wave or repeating pulse waveform will cause both the pulse LEDs to turn on.